The water ministers from Egypt, Sudan and Ethiopia agreed Thursday to hold a new round of negotiations at the ministerial level to discuss their main points of disagreement on the Ethiopian Renaissance Dam. The three countries’ water ministers approved the draft guiding principles during the meeting of the National Committee. These principles will guide the two advisory institutions that are conducting studies on the effects of the dam, the Ethiopian news agency ENA said. 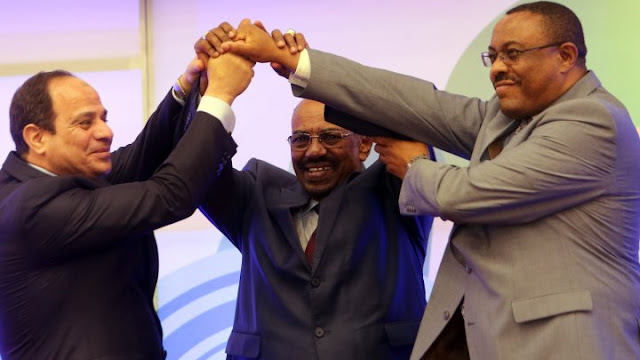 ENA quoted Egypt’s Minister of Irrigation, Mohamed Abdel Aaty, as saying that the Ethiopian Prime Minister Hailemariam Desalegn will visit Egypt within weeks and will sign with President Abdel Fattah al-Sisi comprehensive cooperation agreements. The visit of the Egyptian and Sudanese ministers to the Renaissance Dam on Wednesday is a historic step that opens up more opportunities for dialogue, transparency and exchange of information, Minister of Water, Irrigation and Electricity of Ethiopia, Seleshi Bekele, said. He stressed his country’s full commitment to transparency, to exchange relevant information, not to cause significant harm to Egypt and Sudan, and to maintain cooperation in accordance with the Declaration of Principles, particularly with regard to the first filling of the dam with water and its operation, ENA added. “We have drafted the guideline on the pending issues basically on how to forward the implementation of the consultants,” ENA quoted Bekele as saying on Wednesday.